The first in a clever and charming new crime series that will immediately delight all fans of Agatha Christie and Alexander McCall Smith. Mrs. Laetitia Rodd, aged fifty-two, is the widow of an archdeacon. Living in Hampstead with her confidante and landlady, Mrs. Bentley, who once let rooms to John Keats, Laetitia makes her living as a highly discreet private investigator. Her brother, Frederick Tyson, is a criminal barrister living in the neighboring village of Highgate with his wife and ten children. Frederick finds the cases, and Laetitia solves them using her arch intelligence, her iron discretion, and her immaculate cover as an unsuspecting widow. When Frederick brings to her attention a case involving the son of the well-respected, highly connected Sir James Calderstone, Laetitia sets off for Lincolnshire to take up a position as the family's new governess--quickly making herself indispensable.But the seemingly simple case--looking into young Charles Calderstone's "inappropriate" love interest--soon takes a rather unpleasant turn. And as the family's secrets begin to unfold, Laetitia discovers the Calderstones have more to hide than most. 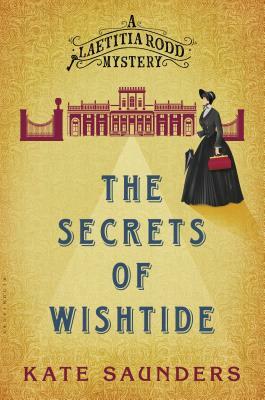 Dickensian in its scope and characters, The Secrets of Wishtide brings nineteenth century society vividly to life and illuminates the effect of Victorian morality on women's lives. Introducing an irresistible new detective, the first book in the Laetitia Rodd Mystery series will enthrall and delight. Kate Saunders is an author and journalist who has worked for the London Times, the Sunday Times, and Cosmopolitan, and has contributed to Radio 4's Woman's Hour and Start the Week. She has written numerous books for adults and children, including Night Shall Overtake Us and Five Children on the Western Front, which won the Costa Children's Book Award in 2014. She lives in London, England.